In celebration of Winstock's 21st year, we are taking to the road in preparation for one of the best festivals yet! Visit these bars for top-notch music, drink specials, and visits from favorite radio personalities as we gear up for Winstock 2014. Of course, a few Winstock tickets and CDs from your favorite artists may be given away at these events, as well. 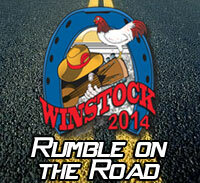 Mark your calendars and plan on making a stop at the "Winstock 2014 Rumble on the Road!"